Hollins, Roanoke College, and Virginia Tech have joined forces to create the Small Cities Institute, an innovative collaboration that’s tackling the crucial issues facing small urban areas around the globe. What are the challenges facing small cities within a globalized world? What can we learn about issues of sustainability, quality of life, job creation, diversity, inequality, housing, and economic development from the experiences of small urban areas? Why is so much academic and research interest focused on global cities at the expense of smaller cities? These are the critical and complex questions driving the creation of the Small Cities Institute (SCI), a new and innovative research and teaching collaboration between faculty and students at Hollins University, Virginia Tech, and Roanoke College. Founded after a series of conversations in late 2015, the SCI is envisioned as the potential leader for small cities research taking place around the world. Associate Professor of International Studies and Political Science Jon Bohland is one of the founders of the institute and cotaught a pilot course with Margaret Cowell, assistant professor in the department of urban affairs and planning at Virginia Tech, for the SCI’s first collaborative undergraduate teaching and research experience. The Small Cities Studio course, taught for the first time last fall, involved six students from Hollins and three from Virginia Tech. 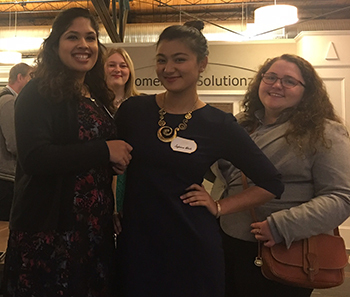 These students developed and carried out a research project at the nationally recognized CityWorks (X)po conference held annually each fall in Roanoke. Additionally, the students designed interactive maps and timelines focused on urban issues in Roanoke and delivered their project findings to a packed house of over sixty city officials and residents at the Roanoke’s CoLab this past December. The studio course will be taught again in spring of 2018 and Bohland is working with colleagues Lori Joseph, associate professor of communication studies, and Anna Baynum, associate professor of education, to develop an academic program focused on urbanization and planning. The graduate assistant for the studio course is Ashley Reynolds Marshall ’04, who is working on her Ph.D. at Virginia Tech at the Center for Public Administration and Policy. Jon Bohland is an associate professor of international studies and director of the international studies program.